Adding to its compact Inno Pocket range of fixtures, which started with the popular Inno Pocket Spot moving head, ADJ has recently released its Inno Pocket Scan and Roll fixtures; two incredibly small and portable, but still very powerful, mirror scanner units. Both offer impressive effects on their own, but truly stunning and varied compact mobile lightshows can be created by combining multiple Inno Pocket Scans and Rolls with Inno Pocket Spots. Both the Scan and Roll offer compact power – much like the Pocket Spot – with each 2.4kg fixture packing in a bright 12-watt LED source. The Scan and Roll’s low weight and compact sizes (294mm and 329mm tall, respectively) mean that DJs can take them on the road as part of their mobile setup, while also making them easy to move and store away. Mobile DJs can bring the dance-floor to life, with the Scan and Roll projecting bold patterns in translucent colours thanks to their sharp 14-degree beam angles and combined GOBO/colour wheels, which offer eight GOBO patterns (plus open) and eight colours (plus white). 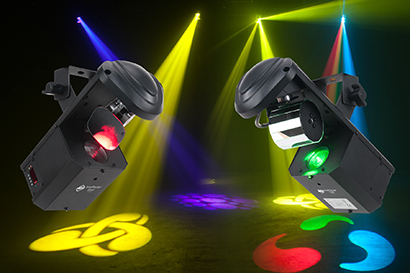 These eye-catching effects mean that the ‘pocket-sized’ fixtures sit nicely alongside moving heads like the Inno Pocket Spot, complementing the Spot’s single beam with their colour patterns. Any combination of Pocket Roll and Pocket Scan units can be connected, along with Pocket Spot moving heads, to create a coordinated lightshow using any of the twelve built-in programs in Internal Show mode, or using Sound Active mode. These stand-alone settings can be enhanced further using Display Inversion mode, which creates a synchronised, professional-looking lightshow, with the various fixtures mirroring each other’s movements. Both the Scan and Roll feature stepper motors with micro stepping, offering extra-smooth X/Y mirror movement. For a more in-depth command over the effects, users can operate the units in DMX-Controlled mode, with six channels allowing control over pan and tilt, strobing, color/GOBO selection, master dimming, and dimmer mode selection. Mobile DJs will also enjoy the freedom offered by the ADJ IR Remote (sold separately) which gives them wireless control over Full On, Stand By, Strobe, Color Change, 0-100% Dimming and Sound Active, all from a distance of up to 9 metres – perfect for DJs who want to operate the fixtures from behind their booth. For added convenience, ADJ has fitted the Scan and Roll with power in/out sockets to allow multiple fixtures to be power-linked. Mobile DJs can link the power supply for up to 35 Inno Pocket Scans and Rolls, reducing the need for extensive cabling. Both the Inno Pocket Scan and Inno Pocket Roll are available now.